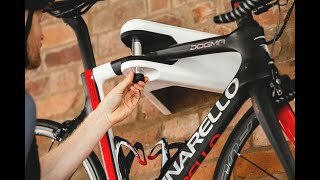 The Hiplok AIRLOK is the latest solution to your bike storage needs, it is the first wall-mounted bike storage hanger with an integrated hardened steel lock, making it a Gold Sold Secure rated lock. It’s the perfect solution whether you store your bike inside or outside, at work or at home. Designed beautifully to look a perfect part of your home, whether you choose to keep your bike indoors or outdoors, the slick, modern design can come in Grey, Red and White and is really easy to put together. It features a rubberized frame protection to save your bike from damage, which is essential with any bike lock. The most important feature of AIRLOK is the Gold Sold Secure rating, Hiplok has tested AIRLOK to withstand a high weight threshold from all angles and constant sustained hammer attack, even if the wall is broken down, all the AIRLOK fixings are still tact. Effortlessly remove and lock away your bike, knowing that it will be safe with the Hiplok AIRLOK. Non pick key cylinder with 3 x coded keys, 4 x high security fixings, 30mm locking bolt, inter steel frame, external casing and frame holder. Impact resistant casing, Non Scratch Frame Holder and Hardened steel frame core.